The Hizbullah terror group affirms its allegiance to Syria, offers to place itself at President Bashar Assad’s disposal. The Hizbullah terror group has affirmed its allegiance to Syria and has offered to place itself at President Bashar Assad’s disposal. “All Hizbullah wants is a peaceful solution between the opposition and the regime in Syria, and although the party displays sympathy and loyalty to those who stand with the resistance (the Syrian regime), our conflict is primarily with Israel,” said Rifai. 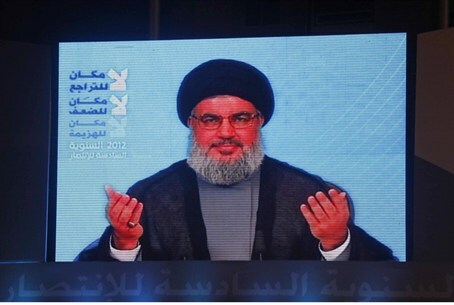 The longtime close relations between Hizbullah and the Assad regime were a key point in Nasrallah’s speech last week, in which he confirmed that Syria supplied Hizbullah with the missilies it used against Israel during the 2006 Second Lebanon War. Israel is now concerned that Hizbullah will get a hold of Assad’s chemical weapons and use them against Israel. Foreign Minister Avigdor Lieberman warned this week that Israel is prepared to intervene militarily if this happens. “In the moment we see that the Syrians transfer chemical and biological weapons to Hizbullah, this is a red line for us and from our point of view it‘s a clear ‘casus belli,’” Lieberman said, using the Latin expression justifying war.